The color with the highest score is the one that is closest to what you are looking for! As the title says, this pattern has many neckline and sleeve length options. It uses a clever "puzzle piece system" so you can flip top sections and switch from one option to the next with a few paper pieces. This pattern works great as a base layer and is the only one with a crew neck and mock neck. Because of the fit, it requires a fabric with nice stretch and recovery BOTH WAYS. Close to the body, the most fitted of the 5 patterns. This pattern includes both a raglan tee and racerback tank (again using the puzzle piece system) but we only talk about the raglan tee option here. It has a relaxed fit (body and sleeve) but is not slouchy. The waist shaping makes highlights the waist without clinging to it. The neckline is a classic scoop neck, a bit lower than the latest Mimosa tee. The tunic version is longer and has patch pockets in the front. Both version have a flattering curved hem. The raglan sleeve (also called baseball sleeve) can bring a little change in your closet and a fun to sew. 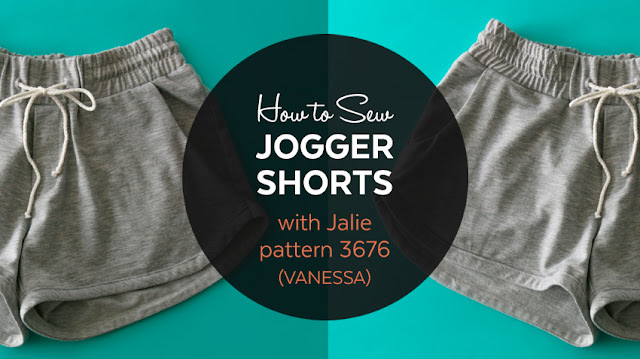 This patterns is in the only one in our top 5 to start at size 12M for little ones! Great for relaxed, sporty look. 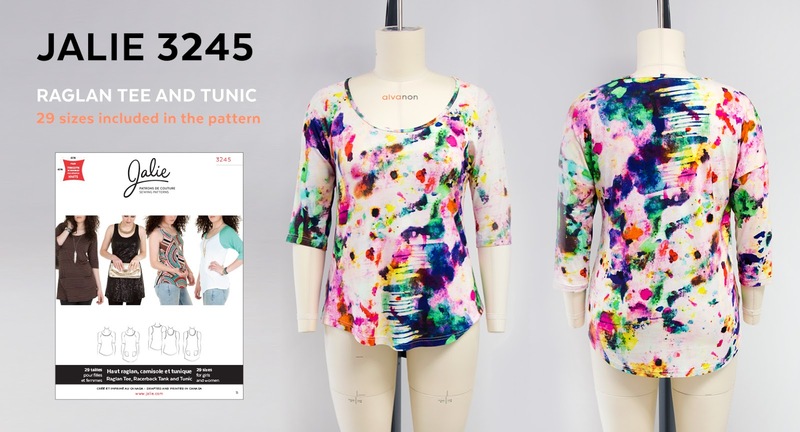 Have fun with contrast fabric on the sleeves! The tunic length worn with leggings makes a great, easy-to-wear outfit. A wonderfully simple design! 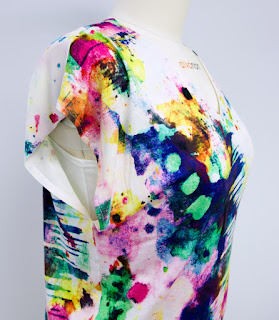 Also called "dropped shoulder" top, the sleeve is part of the front and back pieces. For the short sleeve option, there are only four assembly seams and you're done! It does not get any easier than that! The 3/4 sleeve option is super easy to sew because the sleeve piece has a very flat cap. Neckline can be finished with binding (apparent or invisible) or turned and topstitched. 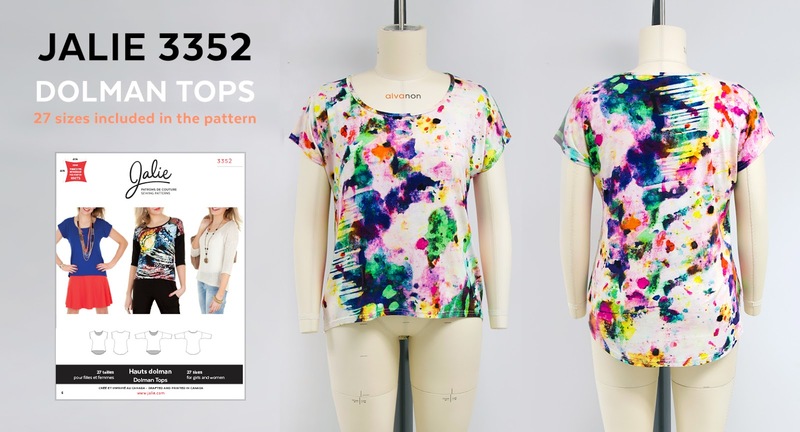 You love comfy tops and have always dreamt of wearing a low-V neckline top that would not be too revealing when you bend over to pick up something on the floor? Bobbie is there for you! It has an ingenious facing that keeps the V neck against the body. It also allowed us to lower the armhole while keeping your bra covered. The magic behind (under) the Bobbie - We've got you covered! Very loose at bust level, tapered at the hips. The facing is fitted but is not a shelf bra, has no compression. There is no bind or binding to sew! Are you one of those people who like the loose-fitting look on other people but think you look silly in a boxy shirt? The Mimosa will be you new best friend! Straight sides that give you some room around the waist, without looking like a tent! 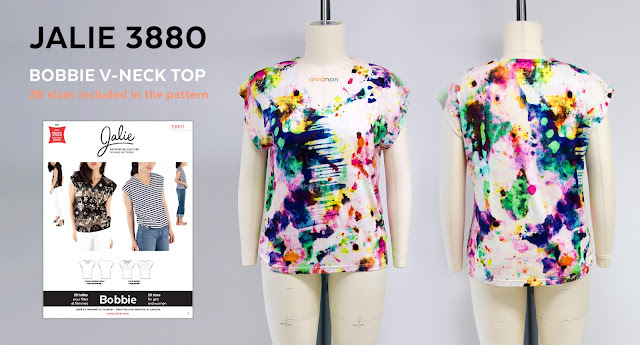 The length and curved side-slit hem prevent the t-shirt from clinging to the hips and causing the dreaded lowerback-fabric-pool :) The sleeve options and optional pocket allow you fill your closet with Mimosas, sporting a different look everyday. 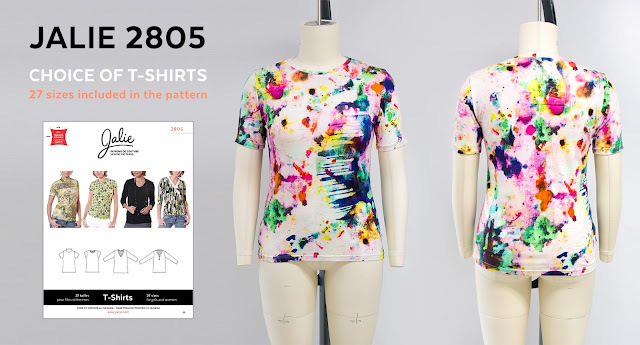 We hope this post will help you pick the best pattern for your next t-shirt project. Don't hesitate to ask questions in our great Facebook group. 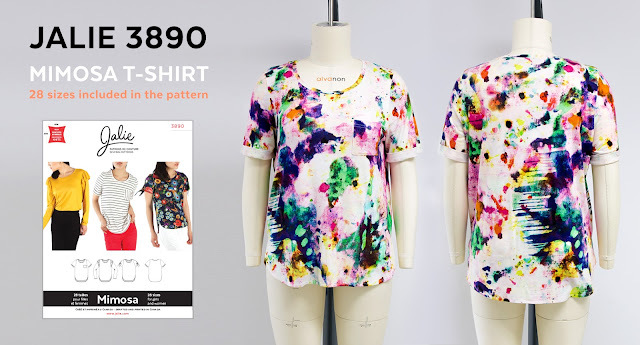 For more inspiration, checkout the photo gallery on our website to see many tops and t-shirts made by Jalie fans around the world.